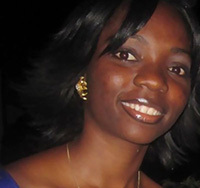 Darline Ntankeu Kenne is a young entrepreneur with a 5 years-experience in entrepreneurship and coaching. After an engineering degree in agro-industrial food processes in Cameroon, her passion for rural development and agriculture-based leadership led her to launching her personal pineapple farm and cassava farm; and currently, launching a fruit juice enterprise. She works with local communities through NGOs and has locally led the implementation of several projects through those NGOs. She is member of the Global Youth Innovation Network (GYIN) international coordination team, an entrepreneurship innovation-based, experimental learning incubator, with exceptionally talented youth at the helm.